Pinehurst No. 2 16 oz. Covo Cup. This Made in the USA tumbler is manufactured to last with a lifetime warranty. 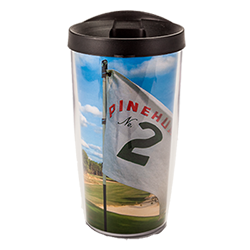 Featuring an inconic view of our Pinehurst No. 2 flag and a custom Pinehurst imprint secured between the double walls. Dishwasher and microwave safe.